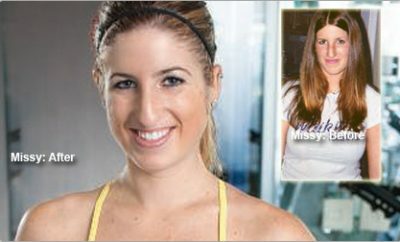 What was the “turning point” that prompted you to lose weight?There was no “aha” moment or “turning point” for me that I can point to that got me started going to the gym. I essentially just started (for a matter of maybe the 112th ime!) going to the gym shortly after New Years, and with the help of a personal trainer who actually showed me the proper way to workout (who knew you were supposed to sweat?? ), started seeing results. Seeing and feeling the results was so incredibly rewarding. I was instantly gratified by knowing that my body was a direct reflection of my hard work (or lack thereof!) and felt motivated to keep pushing. I’ve been trying to lose weight my entire life – starting from the tender age of 5 or 6. I seriously started trying to lose weight, however, in January of 2012, and have lost 150 pounds in the span of this roughly 18 months. The time has flown by so fast! It is why I tell people not to be swayed by how long the process can take, because the time will pass anyway, and when it does you’ll be thankful you started when you did! My very first step was to start writing down everything I was eating, so that I could have an accurate view of my calorie and fat intake versus what I was expending through exercise. I used an app called MyFitnessPal which was very beneficial. From there, I cut down my calorie intake and cut down (and eventually out) as much “junk” and processed food as possible, including sugar, simple carboyhydrates, sodas (diet and regular! ), red meat, and fast food. My biggest challenge was cutting out fast food. I had, for lack of a better term, become addicted to fast food and ate out nearly every day, and usually 2 (sometimes 3) meals a day. My husband at the time was a manager at a fast food restaurant, so I had unlimited access to quick, easy, yet highly processed and calorie dense food. It was tough, but the way I got through it was educating myself on exactly what I was eating through knowing how many calories were in what, and also learning the kind of chemicals and preservatives that are in that kind of food that I was then putting in my body. Oh yes! Nearly every day I was tempted with sugary and salty treats, and had to choose every day not to waiver from my workouts. Let’s be honest, it’s so much easier to eat junk and sit and watch TV then it is to make a good healthy home-cooked meal after going to the gym for an hour. But I stuck with it by setting realistic and achievable goals and writing them down, journaling, reading several self-help books about emotional eating, and nutrition science, and spending hours on Pinterest re-pinning motivational quotes, workout routines, and healthy recipes. I associated more with people in my life who were already living healthy lifestyles or were on similar journeys as myself. I tracked my progress regularly and congratulated myself for each and every small success – such as being able to fit in clothes that were once too small, being able to wrap a single bath towel around my body, running at a slightly faster pace on the treadmill, all of it is amazing and should be celebrated as it definitely keeps you motivated! 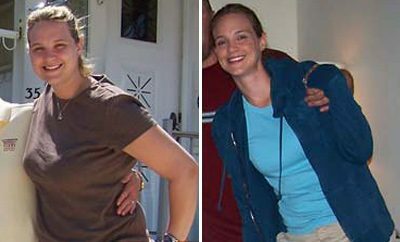 I reached my weight loss plateau around 170 pounds, after a 140 pound weight loss. I pushed through it by incorporating high-intensity interval training to my cardio days, changing up my workout routine by adding different types of cardio (elliptical, high incline hikes, etc. ), and lifting heavier weights to continue to build muscle. With regard to my diet, I added in more healthy fats like avocados, olive oil, and almonds, and started again with tracking my diet to make sure I wasn’t over-consuming calories each day, or under-consuming them, putting my body into starvation mode. Sunday, Tuesday, Friday, I do a workout that combines strength training with cardio. Saturday, Monday, Wednesday I complete one hour of straight cardio (running outdoors or on treadmill, or eliptical usually) and add some ab work at the end. Fridays are my “off” days and that doesn’t mean vegging out on the couch and doing nothing! I’ll go out dancing or go for a nice walk, but nothing too intense, and I’ll also foam roll to work out my muscles and allow them a day to recover. I eat 5 small meals throughout the day, about 3 – 4 hours between each. My breakfast typically consists of a ½ cup of oatmeal with stevia and cinnamon or flax seed, and some kind of lean protein – egg whites or greek yogurt. My morning snack is usually high in protein, like a protein shake or Greek yogurt and vegetables. Lunch is generally a salad comprised of lots of leafy greens, yummy vegetables, and a lot of protein like salmon, tuna, or cottage cheese. Afternoon snack? You guessed it – more protein! Usually a handful of nuts or cottage cheese. For dinner, I eat A LOT of vegetables and another lean protein like tofu or fish. I just recently made the decision to go pescetarian as I found red meat and even chicken and turkey to be too calorie-dense for my liking compared to the amount of protein I was getting. Plain Greek yogurt! It can be dressed up with Stevia and cinnamon as a nice yogurt snack, accompanied with apple slices or other fruit. It can also be mixed with any kind of spice you like – garlic seasoning, French onion soup dry seasoning, or just plain old salt & pepper as a yummy veggie dip. It can be mixed with lime juice and cilantro and used as a taco dinner sour cream substitute. Low in calorie and high in protein which leaves you feeling full, the creative possibilities are endless! Love yourself and love your body. Know and believe that the best way to show yourself and the body the respect it deserves is by fueling it with good, healthy, nutritious food and showing it good exercise. Sugar, chemicals, processed food, it’s all bad for you, no way around it – love your body and it will love you back! My life since weight loss has had it’s up and downs, and everything in between, but I wouldn’t change a single day of it! On the negative side, I feel that losing as much weight as I did aided in bringing some things to light regarding my marriage and I have since divorced, which was difficult. On the flipside, however, so many amazing opportunities have been brought to me. I live in Colorado and am able to enjoy so much more of the outdoors that this state has to offer because I love being active (I crave it!) and I love being outside in the sunshine. As a result of my weight loss, I’ve also had the amazing joy of being a support and inspiration to people around me, and have realized my true purpose in life to help others on their path to becoming healthy. Therefore, I am currently working towards my NASM Certified Personal Training certificate, and have created a website called Fitlove and have a Facebook page too. I share advice, my stories, my struggles, motivations, even recipes and other resources. It has been incredibly fulfilling and I am so grateful! Don’t assume that anyone with weight loss success has done so by being perfect every day, and don’t be discouraged and derailed from your ultimate goals when you’re not perfect every day. 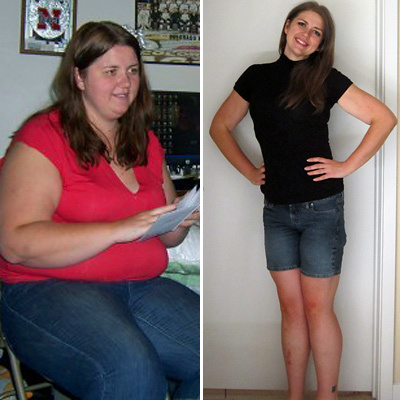 I didn’t lose 150 pounds by eating healthy every day, never giving in to temptation, never missing a workout – far from it! Instead, any time I slipped I said “Ok, it’s done, it’s behind me now, but my next day, my next meal, my next opportunity to work out, I’m going to be better!” It gets easier over time, you learn to love food that fuels your body in healthy, nutritious ways, you learn to love sweating and working out. Just keep at it and keep going! Thanks Taryn. I am starting my new life today by changing my diet and and starting a weightloss journal. Thanks for all the advice. Awesome what do if u don’t have the money to join a gym???? Very inspiring story. It’s March 1st. A great day to start the rest of my life by following my Weight Watcher program and tracking what I eat. From huge to HOT. Congratulation on ! Very inspiring Taryn, I shared your story and liked your Facebopok page! 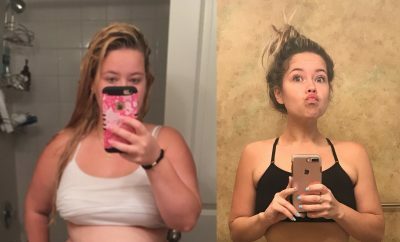 I too lost over 150 lbs in a relitively short period of time, and can definitely relate to Taryn’s story. So glad to see she is paying it forward and helping others by sharing her amazing success! Way to go Taryn! Great Transformation! You look fabulous! It works I’m down 24.6 since Jan 1st. I use myfitnesspal app. And I post every time I workout to help me stay motivated! Great job!! I love your story Taryn! It is the same as mine (starting weight, myfitnesspal and pinterest). So far, I am down 55 lbs. You have inspired me by showing me the finish line! Thank you and congratulations!